But then my friend helped me realize… he was always the one initiating every conversation and date. How was he supposed to know that I wanted to go on more dates with him if I don’t communicate with him? Men cannot read our minds, ladies! It feels safe to be pursued. My guarded heart only wanted him to know I liked him if I 100% knew it was going to be reciprocated. I was terrified of getting hurt. One of my friends came home from an online date so put out about the restaurant her date took her to. Here’s the thing though: she didn’t tell him she didn’t want to go there. He picked it out, ran it by her, and she said nothing. She didn’t want to be too much. And shouldn’t he know that’s a crappy restaurant—and if he doesn’t, clearly he has bad taste. She punished him for not reading her mind. That’s not fair. Ladies, you have the permission to communicate your wants and needs. Let’s reject the lie that we’re not enough and too much all at the same time. It keeps us small and stuck. If a guy is so easily spooked by you letting your desires be known, then he is no man for you. Let’s also stop setting men up for failure by expecting them to be mind readers. Communicating what you want is not pursuing. It’s giving you the opportunity to be true to yourself, while also creating an opportunity to let your guy know where you stand. He then has the option to lean into that or not. By communicating your needs you’re creating vulnerability, honesty, and an invitation. And that is way different that a demand. Who doesn’t like talking about themselves? I know I do. Allow yourself to be curious to get to know the person you’re interested in. Asking questions and getting to know him is very low stakes. Then the next time you see him you can ask, “Hey, how’s that thing going”. It shows you’re listening, and you care about him. He was on your mind. It’s also incredibly easy to practice. I used to be so scared of rejection that doing this felt like I might as well be walking up naked to a guy proposing. It doesn’t have to be this way. At all. Plus, who cares if he thinks you like him. You do, don’t you? Even if the feelings aren’t reciprocated, like my bestie says, “No one has a bad day when they find out someone has a crush on them”. I talk to so many baffled single women. After spending a few minutes chatting about their day-to-day lives; it’s no wonder they’re not dating. Every night of the week is spent either at home watching The Bachelor (hey…I love the Bachelor), having a girls night, or going out with the girls. Your man is not gonna magically appear on your doorstep friend. You gotta get out there. And do you know just how intimidating it is for a man to come up to a group of women out at a bar? If you do go out with the girls, split up. Or be each others cheerleaders as you take turns going and saying hello to somebody interesting. We create space in our lives for the things we value. Part of putting yourself out there is creating space for interactions with single men. Tell me, friend. Why aren’t you putting yourself out there? Are you hiding behind a fear of failure? Rejection? Getting out of your comfort zone? 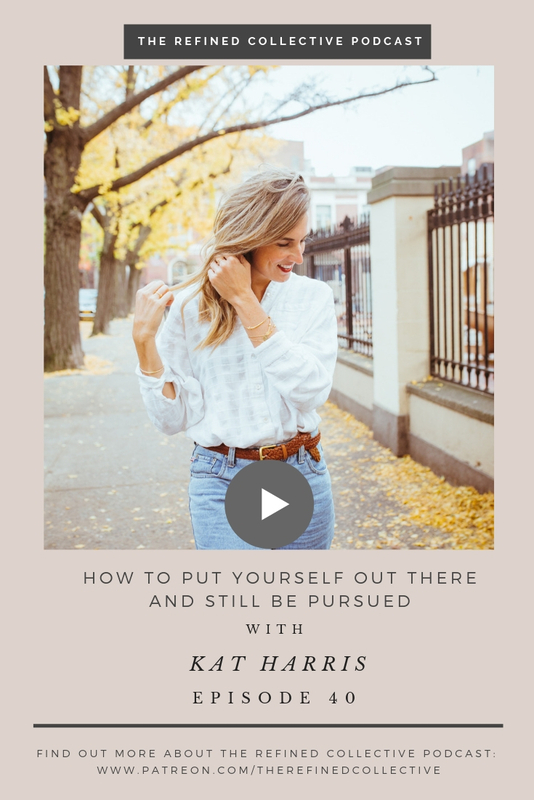 For more on how to put yourself out there, check out 5 Ways to Put Yourself Out There and Still Be Pursued. Head over to Instagram to share your answers—be sure to tag @therefinedwoman and @therefinedcollective. If you want to continue the conversation in a more private setting, join my Private TRW Single Ladies Community!